For the family, couple, or business person that expect the best, this spacious and unique new home is located in Connestee Falls, a private community located 15 minutes away from downtown Brevard. The drive from downtown Asheville and the Asheville Regional Airport is less than an hour. Drive time from Greenville, SC is also less than an hour. Serenity, as the word evokes, will provide guests a restful and relaxing haven to unwind from the sounds and sights of urban life. 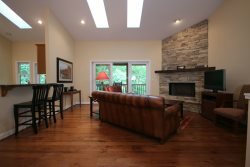 Whether sitting on the large deck off the family room, the stone tiled patio below, or from the private balcony area off the master guest bedroom, guests will find calm in the ever changing vistas of the Blue Ridge Mountains. The view features four mountain ranges visible from over 30 – 35 miles away. Guests will enjoy the remarkable mountain views when they enter through the front door. Designed and furnished to give guests a luxurious vacation, this upscale home offers 2 bedrooms, both with private full bathrooms and a half bath for guest convenience. The master guest boasts an air tub and a rain shower that will soak your cares away. The second guest bath features an oversized shower that is tiled from floor to ceiling. The beauty of this new home is its simplicity and elegance along with its reclaimed hardwood floors throughout the entire house. Additionally, granite counter tops, a wine cooler, double ovens and a microwave oven make up a gourmet kitchen with the finest cabinetry and a pantry. Sip your coffee in the custom breakfast nook or enjoy breakfast outdoors on the deck or terraced patio. Guests will have the privilege to experience the first floor of this lovely two story house and enjoy full access to this level. The home sits at the end of a cul de sac for peace and quiet with little or no traffic. If you fancy a walk, there is a 4+ mile trail beside the house that will lead guests to waterfalls for which Transylvania County is known. Or, mount your bicycle and head to the bike-friendly local roads that wind along the French Broad River and Western NC country side. This area features world class cycle training. Fly fishing waters are located within minutes of this home as well as access to Pisgah National Forest, Dupont National Forest, and SC Caesar’s Head Sate Park also. Because this home is in Connestee Falls, you will enjoy excellent amenities, including 13+ miles of maintained private hiking trails and a George Cobb Designed Golf Course. Everyone was very friendly. Isaac and the staff were very helpful and welcoming. I have such gratitude for our time in Serenity, it was absolute joy from the moment we walked in the door to the moment we left. If you need a sense of connection, a break from the day to day, then this home is the place you will find it. Serenity is absolutely joyful and bliss. There is nothing more wondrous then watching the world awake every morning, the storms rolling in, the sunsets, and the mist rising and falling.